A new support card for Chronojet focused Zodiac Time Beast Decks appears! 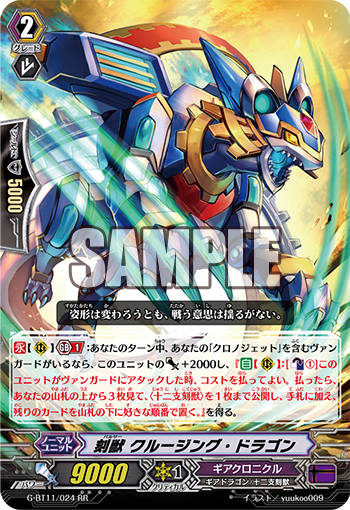 CONT [RC] Generation Break 1: During your turn, if you have a vanguard with “Chronojet” in its card name, this unit gets Power +2000 and “AUTO [RC]: [Counter Blast 1] When this unit attacks a vanguard, you may pay the cost. If you do, look at the top three cards of your deck, search for up to one Zodiac Time Beast from among them, reveal it to your opponent, put it into your hand, and put the rest of the cards on the bottom of your deck in any order.”. For Today’s Card, we’re introducing a card from the 11th Booster “Demonic Advent” (on sale June 9th, 2017): “Pustar, Crusing Dragon”, who supports 《Gear Chronicle》 〈Zodiac Time Beast〉 Decks! “Pulsar, Cruising Dragon”, if your Vanguard is “Chronojet”, gains Power+2000! And when it attacks your opponent’s Vanguard, by paying 1 Counter Blast, you can look at the top 3 cards of your Deck, you can add a 〈Zodiac Time Beast〉 among them to your hand. Along with the amazing fact it can attack with 11000 Power on its own, it can also add 〈Zodiac Time Beast〉 cards to your hand, like the Perfect Guard “Steam Tamer, Arka” or the Heal Trigger “Chronotherapy Hamster”, that you can use to Guard during your next turn. Also, it works very well with the 〈Zodiac Time Beast〉 support cards in “Demonic Advent”, so make your Deck stronger by adding a ton of 〈Zodiac Time Beast〉 to your Deck.